The Shelf Diaries… – A blog for book reviews, ramblings and discussions. A blog for book reviews, ramblings and discussions. Now, at age sixteen, she’s come back to stay – in order to solve the mystery of her mother’s death. In the process, she uncovers an international conspiracy of unsettling proportions, and must choose her friends and watch her foes carefully if she and the world are to be saved. All Fall Down follows the story of Grace. Following the death of her mother, she is sent to live with her grandfather who lives on Embassy Row. Grace is consumed by her belief in the fact that her mother did not die by accident – that she was murdered. This belief sets her firmly on the path towards finding out how her mother actually died. 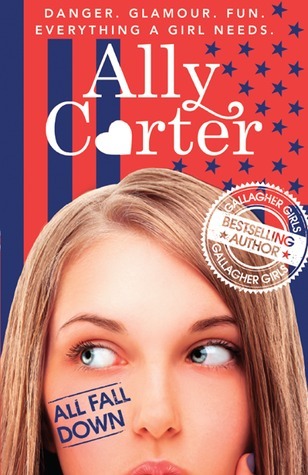 I am a huge fan of anything written by Ally Carter. I loyally followed her Gallagher Girls series from start to finish and I couldn’t wait to get my hands on the first instalment of her new series. It didn’t disappoint! Ally Carter has a knack for storytelling. She just has this way with writing that draws you in. I don’t think it has ever taken me more than two sittings to finish her books. All Fall Down is no different, it’s gripping and action pact from start to finish. As always there is a signature twist at the end. One thing that needs to be mentioned is how hilarious/interesting the politics in this novel is. The interesting part due to how the grown ups behave towards one another and the hilarious part being all of the embassy’s children trying to mimic and follow all the norms between the countries. The only gripe I will ever have with this novel is the cover. For young adult, it is awful. I would definitely favour a cover change or a switch to the U.S edition at this point. Apart from that I can’t wait for the sequel. See How They Run (LOVE THE TITLE) comes out January 5th, 2016! I was sent this for free by the publisher in exchange for an honest review. In Victorian times, goblin men had only to offer young girls sumptuous fruits to tempt them to sell their souls. But what does it take to tempt today’s savvy girls? Six days before Esme’s fourteenth birthday, her left eye turns from brown to blue. She little suspects what the change heralds, but her small safe life begins to unravel at once. What does the beautiful, fanged man want with her, and how is her fate connected to a mysterious race of demons? I have been a huge fan of Laini Taylor for a number of years now. I need to get a move on and finish her Daughter of Smoke and Bone series but what I have read of that, I have enjoyed. When I found out that Laini’s short story collection was being published again, I basically asked the publishers how high they wanted me to jump! I usually stay away from short story collections but this one was definitely worth the chance I gave it. 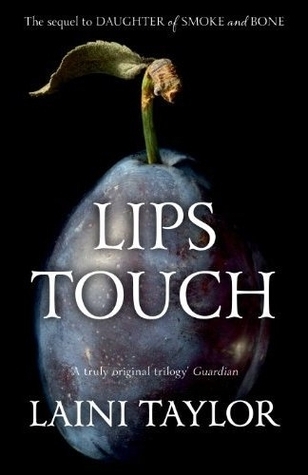 This collection consists of three short stories where a kiss proves to be a turning point in someone life, albeit for the better or for the worst. Goblin Fruit follows the story of creatures that try and obtain the souls of young girls. It is incredibly dark and majestic. The pacing was brilliant for a short story and I adored the ending. Not my favourite of the three but it was a great read and so eerie! Spicy Little Curses was hands down my favourite of the three short stories. It follows the story of a cursed English girl whose voice kills anyone who is unfortunate enough to hear it. I found it cruel that this person was essentially a grenade in waiting. Again, I adored the ending and I honestly think that this could easily become a series. Hatchling was my least favourite story by far. I can’t comment too much as I found it difficult to follow and I couldn’t even tell you what the story was about. I think that there was something wrong with me as opposed to the novel but I couldn’t work with this story at all. It definitely wasn’t the best way to end something that I initially enjoyed so much! I think two out of three stories isn’t half bad when it comes to a short collection. If you love Laini’s writing style, you will definitely love these reads! This novel was sent to me for free in exchange for an honest review. Trial by Fire follows the story of Lilly Proctor. Her persistent allergies stop her from enjoying her life to the full. After a chain of events including and embarrassing situation with her long time crush, she finds herself in her alternate version of an hometown of Salem. I am a huge fan of Angelini’s Starcrossed Trilogy so when I found out that she was writing a new trilogy about witches, I was on board regardless of the story. Trial by Fire did not disappoint. The writing style is incredibly easy to follow, it has a way of just bringing you in to the world and the story. Lilly is not the most likable character and but it didn’t take away from the plot at all. When it comes to witch novels you tend to find that there is little explanation behind the characters abilities. It is simply magic. I adored the concept of Crucibles and Mechanics. To have some level of rhyme and reason behind a witch’s abilities made the read so interesting! My only gripe with this first instalment is the ending. Josephine Angelini is notorious for painful cliff-hangers. Trial by Fire is dangerously close to not being finished. Luckily its sequel, Firewalker, comes out August 27th, 2015. You seem to have stumbled upon my book blog. I hope you enjoy. Showcase Sunday #17: I’m Baack!